And then grew into a bracelet ! 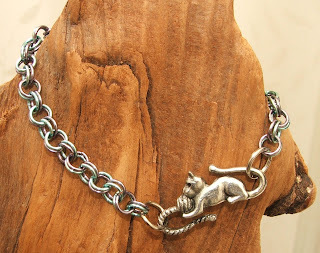 I have had the cat fasten for ages but can't decide whether it goes with the bracelet or not?? That's the trouble with using coloured rings! Where has all the time gone? This blog has been very sadly neglected over the past few months. Sorry blog! I have been busy completing a year long course on dyslexia - which was very interesting but very time consuming. I also sadly lost my lovely dad in April and so haven't really been in the mood for anything creative. 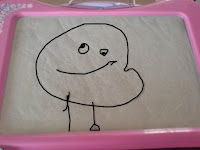 But it's now the school holidays, I have some time & so now is a good a time as any to get going again. A couple taken at the Yorkshire Sculpture Park - one man-made & one natural sculpture (a yew tree). 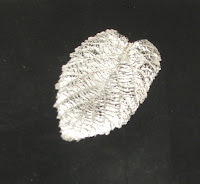 I've also played a bit with Art Clay Silver & made a few small pieces, including this leaf pendant. 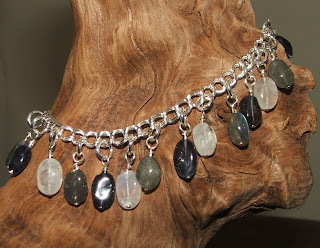 I also got round (at long last) making myself a sterling silver bracelet with laboradorite, iolite & moonstone - the photo doesn't do the stones justice as they really flash with gorgeous blue colours. http://www.folksy.com/shops/IzzyWizzyBeads but need to add some more to it. 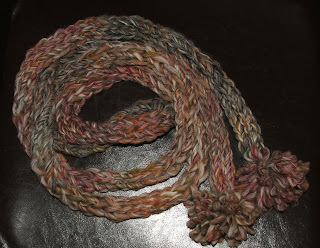 Here is my first scarf - made with one 50g ball of chunky Rowan wool. Because it's only thin, it can wrap several times around & feels lovely & snuggly! Oh my Goodness, where has the time gone?! I haven't posted anything for months! (oh, the shame!) 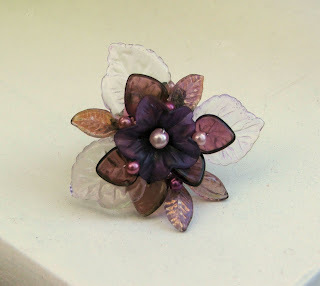 But to be honest, I've not done much crafting at all, due to the workload on my distance learning course. So here is a bit of a catch up! 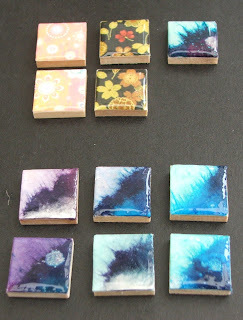 I made some more photo tile cufflinks for a colleague and also a photo tile keyring for a friend (sorry no pics). 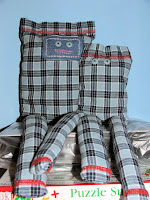 I've sold a couple more items off Folksy (in spite of my totally rubbish photos on there!!) & I must get myself together & add some more bits & bobs. I ventured into the scary world of sewing by making this sock monkey from a little pair of my sons socks. I amazed myself by managing to sew in a straight line, so when he outgrew his favourite pyjamas I decided to try & make something out of them. He was quite determined with what he wanted me to make & my brief was "like a cushion, not girlie, with a wobbly mouth and legs". Here's what evolved..... Mr PJ and his sidekick Mini PJ!! Today I even managed a bit of very basic beading. 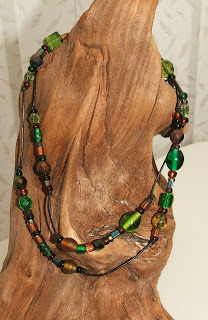 I used a mix of greens & browns to make two "multi wearable" necklace/bracelets (I really must think up a better name!). They are basically just beads threaded onto knotted leather thong that can be worn as a necklace, choker or wrapped several times round the wrist as a bracelet. The photo is rubbish but you get the idea! Very simple, but I just like the colours together. I haven't done too much crafting lately but I have made this ring for Chloe. 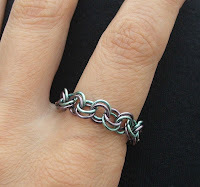 It uses the same sieve blank as the Vintage Ring I made for myself, but the request was for purples & pinks. Hope she likes it ! Then it was a question of cropping this and doing more Photo Shop trickery to try and turn it into an image that would look good on a tile. I turned it into a simple black & white line drawing, shrunk it right down and then added blended chalks in pinky/purple to give it a bit of a coloured background. Here's how it ended up (although it still needs another coat of glaze and a hanging bail). The photo is not brilliant as it's so hard to see pale colours as the glaze is so reflective - it does look better in real life, I promise! Another Group & more Ideas! 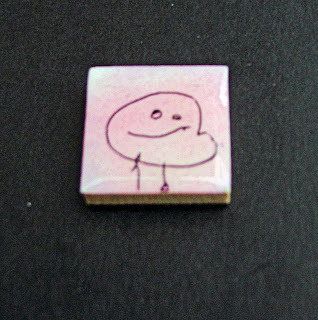 Well I still can't believe I sold one of my tiles on Folksy!! I only put it up that morning too! Here's hoping the buyer still likes it when it arrives. I've added two more tiles today. The top ones are made from a fabby peachy/pinky paper that has little bits of glitter on it, some black,red & gold flowery paper and....drum roll....you can see - I have tried out a new idea, using mulberry paper. The one in the top group is finished, the bottom group just need one more coat of glaze but I am rather pleased with the effect.